Aero-Cruise Balloon Adventures Gift Certificates are the perfect gift for any occasion. Give the Gift of Flight. Come Adventure With Us! ***Online Special***Buy a hot air balloon certificate online and pay our lowest rates. Buy now to save up to $90 off our regular rates (Click the certificate image below to see certificate options and pricing.) Gift Certificates can be used any day of the week year-round and are delivered to your email within hours of purchase! Ballooning certificates make the perfect gift for any occasion. Aero-Cruise Balloon Adventures offers year-round hot air balloon rides along the Colorado Front Range. Come Adventure with us and explore Colorado from a new and unique perspective. Through our site you will have easy access to flight information, rates, our background, contact info, and ways to connect with us through social media. During winter hot air balloon rides in Colorado, it feels warmer once the balloon ascends off the ground due to a temperature inversion layer, heat produced by the burner, and the apparent lack of cool breeze due to traveling with the wind. The post-flight champagne celebration dates back to the 18th century. When farmers would run out to their fields to meet hot air balloons, champagne was offered and shared to help commemorate the experience. 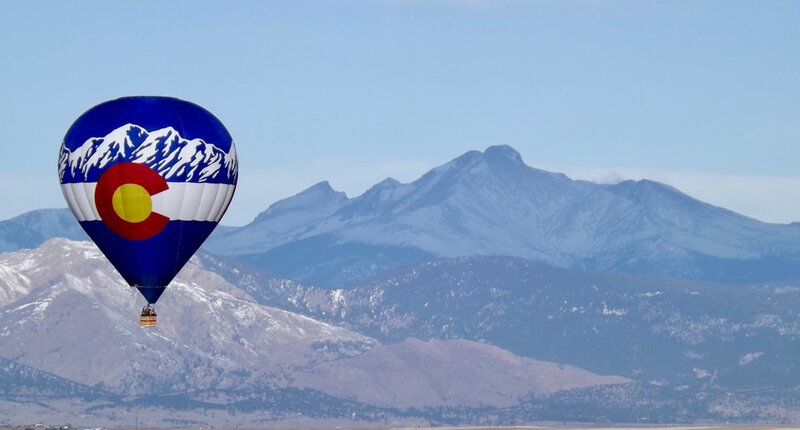 Calm morning winds, blue skies, nearly 300 days of sunshine a year, and great views including the Boulder Flatirons, Longs Peak, Pikes Peak, and the Front Range/ Continental Divide/ Rocky Mountains, make year-round hot air balloon rides in Colorado an incredible experience. Other than up and down, flight direction in a hot air balloon is based on the wind direction at different altitudes.